I am often asked “What are you reading? What have you read? 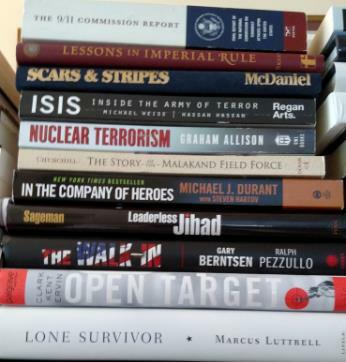 and What should I be reading?” Depending on who is asking and the topic of interest, I have different lists of books for individuals interested in terrorism, asymmetric warfare, tribes of the NWFP, law enforcement, histories and general reading. Some of the lists are eight to ten pages long, other topic lists a mere three pages. 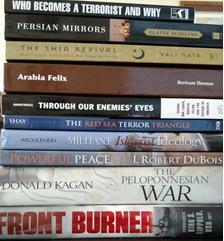 With an office library and a home library I can be like Thomas Jefferson when it comes to purchasing books. Even with a Kindle, the number of books I have purchased has actually increased. I do love a good hard covered book but with a Kindle, I can carry and catalog hundreds of e-books on this marvelous electronic device. In July 1771, Robert Skipwith asked Thomas Jefferson for some help in choosing some books to “absorb culture as painlessly as possible by reading the smallest amount of well-selected books.” Jefferson sent Skipwith a list of 148 titles that comprised 379 volumes. On my office desk, I am reading Playing to the Edge by Mike Hayden. By my nightstand, is a copy of The Immortal Irishman: The Irish Revolutionary Who Became an American Hero by Timothy Eagan. I am finding Eagan’s book hard to put down at night and have now tried to limit my nighttime reading. Eagan writes about the life of General Thomas Meagher who commanded the Irish Brigade during the Civil War and his flight from Ireland. 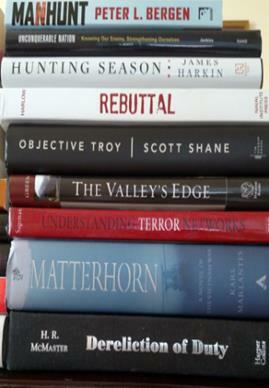 Here are just a few books not in any order that I would recommend everyone read.